NO INGAME PURCHASE FRENZY – there is just one buyable product: “Unlock the full version”. 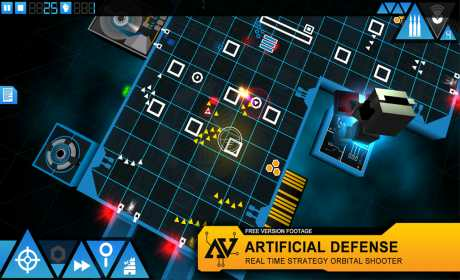 Artificial Defense is a real-time-strategy, orbital-shooter game in an artificial, virtual reality setting. You are the machine, a mighty computer-system, defending its servers against swarms of intruding creeps. 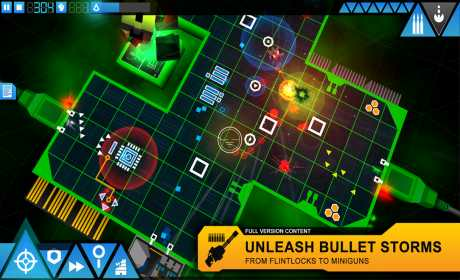 Fire off miniguns, launch hellfire missiles, drop incinerating hades-bombs and asteroids, deploy mighty railgun and acid towers and spawn your own Intrusion Counter Measures (ICMs) to re-conquer corrupted databases and firewalls. Earn RAM and upgrade your arsenal and hardware-level. Start as an analog punch-tape system and evolve to a quantum A.I. computer. There are 21 offense weapons available, reaching from outdated flintlocks, over maverick-missiles to devastating meteors and neutron-bombs. 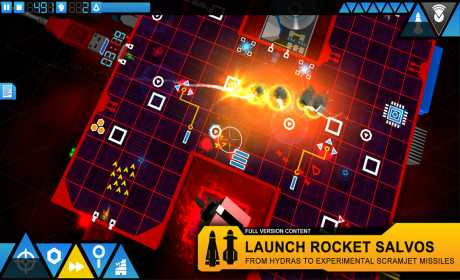 There are 21 defense towers available, reaching from pistol-sentry-towers, over incinerating flame-throwers to powerful long-range railgun-towers. Additionally there are production towers which produce your main-resource: RAM (Random Access Memory). Yes, building up a small RAM economy is very important. Spawn Intrusion Counter Measures (ICMs) in order to conquer corrupted system-structures like databases, honeypots and firewalls. Databases e.g. spawn datablips which carry valuable data out of the system (backup). In this case you will have to secure a safe path to the backup-devices, by using your offense and defense equipment. Since the game is free you can just give it a try and test it on your device. If you encounter performance issues, just reduce the graphics level in the settings.